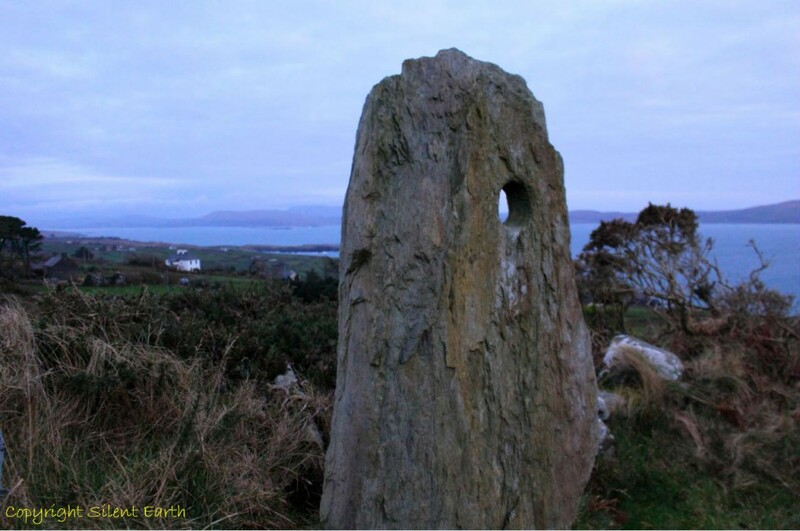 On Sunday 18 December 2016, I set off with Terence Meaden from our base in Rosscarbery Co. Cork, Ireland to Sheep’s Head Peninsula in West Cork in search of the Caherurlagh Prehistoric holed stone. 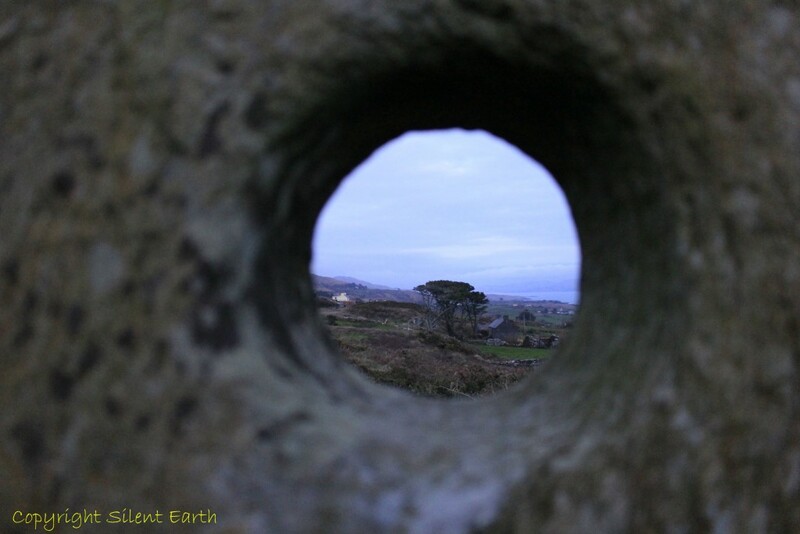 After arrival at the old butterhouse building at the Black Gate in Kilcrohane, it took us approximately an hour to locate the elusive stone, signposted 20 metres south of the Sheep’s Head Way walking trail, arriving shortly before sunset. The setting sun, which had earlier been revealed in all its glory for a few short minutes, was to be obscured by cloud during our visit. 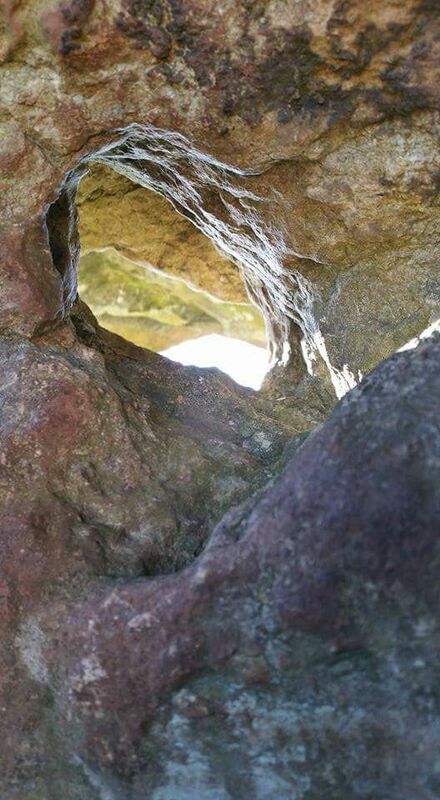 The hole in the stone is narrower on one side than the other. The man with a bigger hand put his through the wider side and the woman put hers through the narrower side. 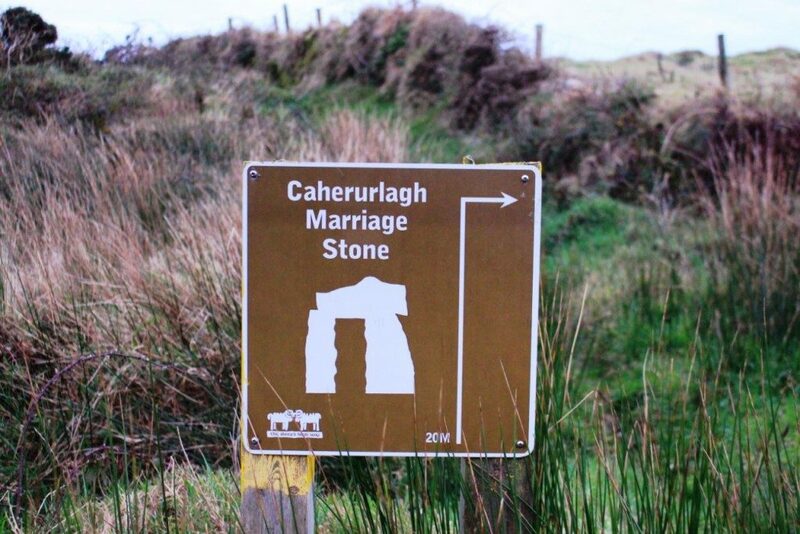 The couple made their betrothal promises with hands linked through the stone. Looking east through the hole. 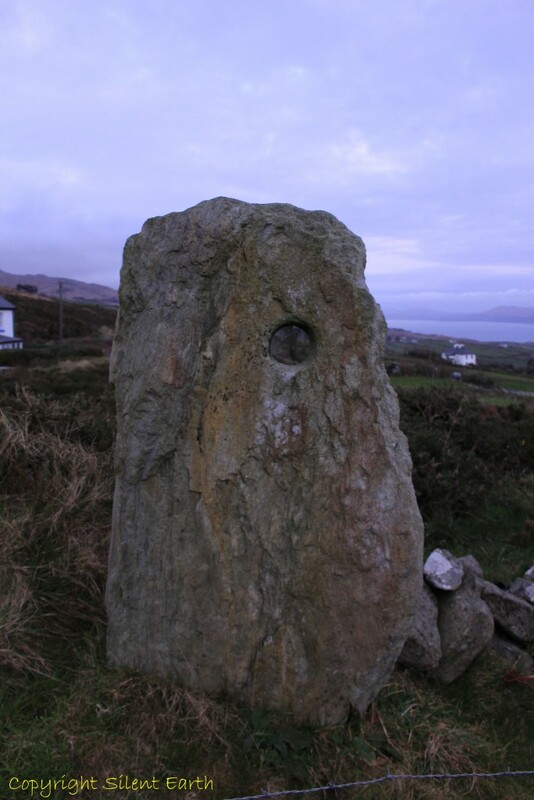 The stone, having previously fallen many years ago, was re erected in July 2012 and its location is provided here. 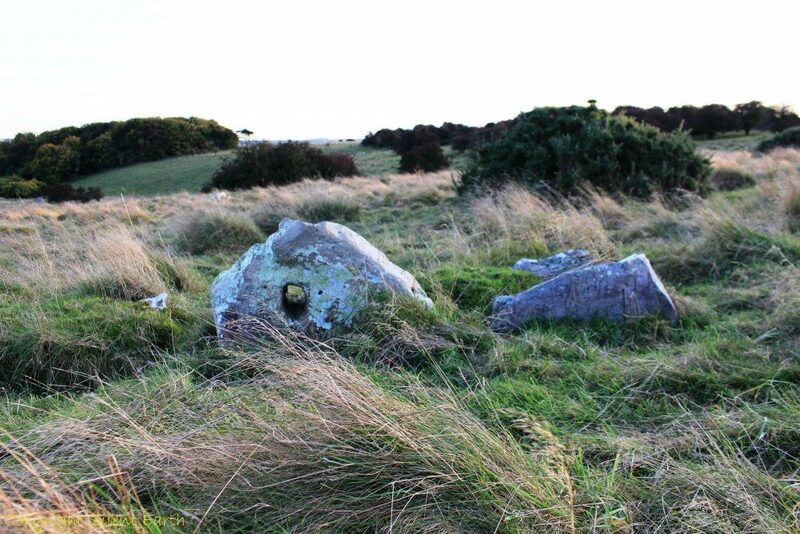 It stands high in a field that slopes southwards down towards the sea, which brings to mind a similar stone standing in an open field in North Ronaldsay, an Island in Scotland described in Frontiers informative article here. 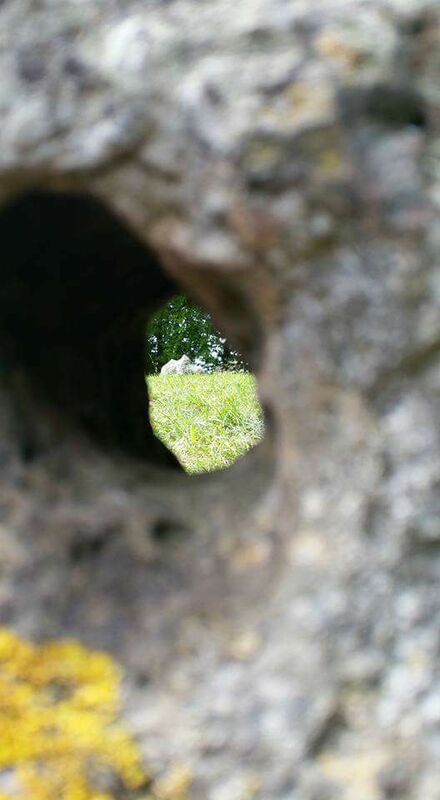 There is a distinctive additional visceral element to being in the presence of a stone one can see through from two sides and pass one’s hands through. It is not therefore surprising that when Christianity prevailed, these holed stones were particularly abhorred and actively destroyed. As a result, unfortunately, very few survive. 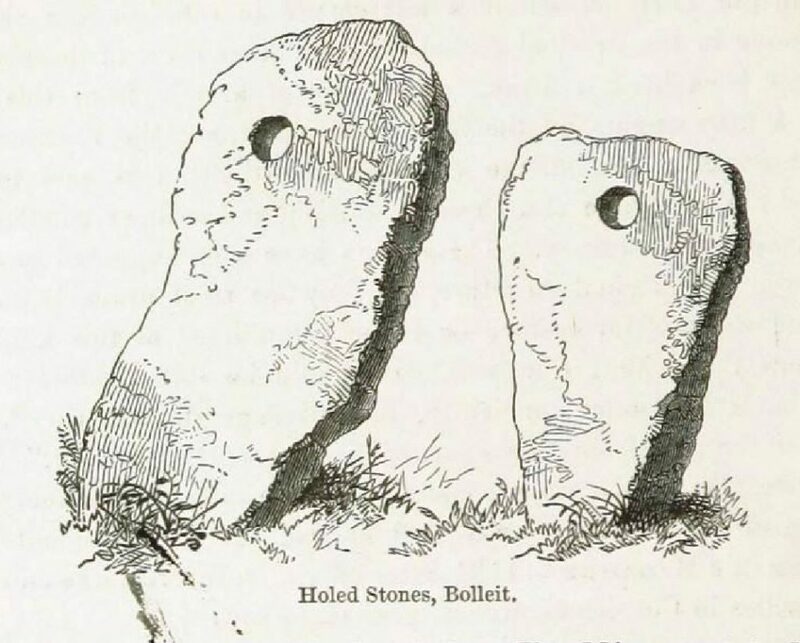 In India, holed stones are often associated with sorcery, and many folk tales and legends are attached to the few that remain in Britain and Ireland. 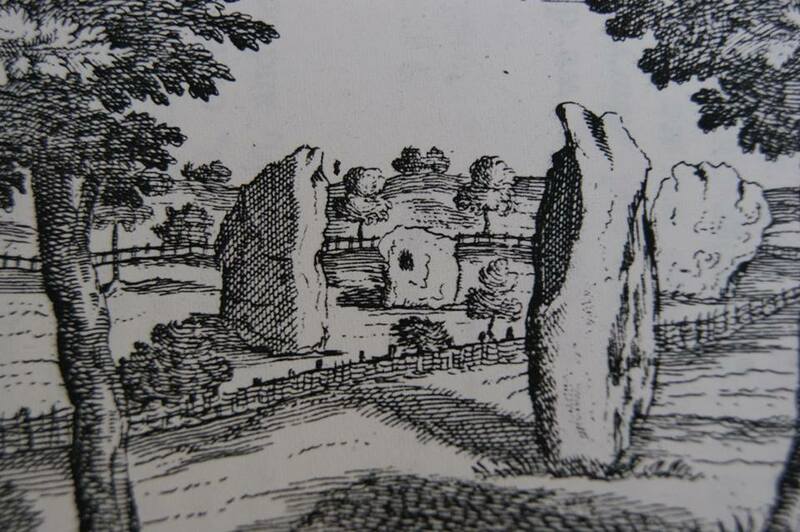 Below is the holed ‘Ring Stone’ at Avebury stone circle in Wiltshire, being William Stukeley’s corrected proof of his ‘A view of the southern temple’, tab. xvii of Abury (1743) the reference is Bodleian Library MS. Gough Maps 231. 48. The stone no longer stands, having been destroyed by the villagers of Avebury in the 18th or 19th Century. Thousands of sarsen stones are scattered across the Marlborough Downs. Was this stone selected and re-positioned to act as a focal stone of some description? Its proximity 150 yards from the polishing stone where Neolithic man spent many thousands of hours polishing and grinding tools begs many questions. 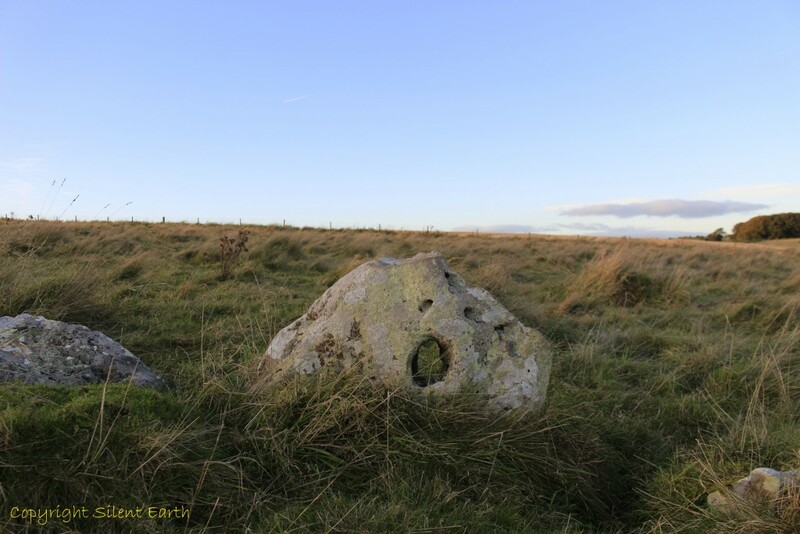 A short article on the stone is published here by The Northern Antiquarian. 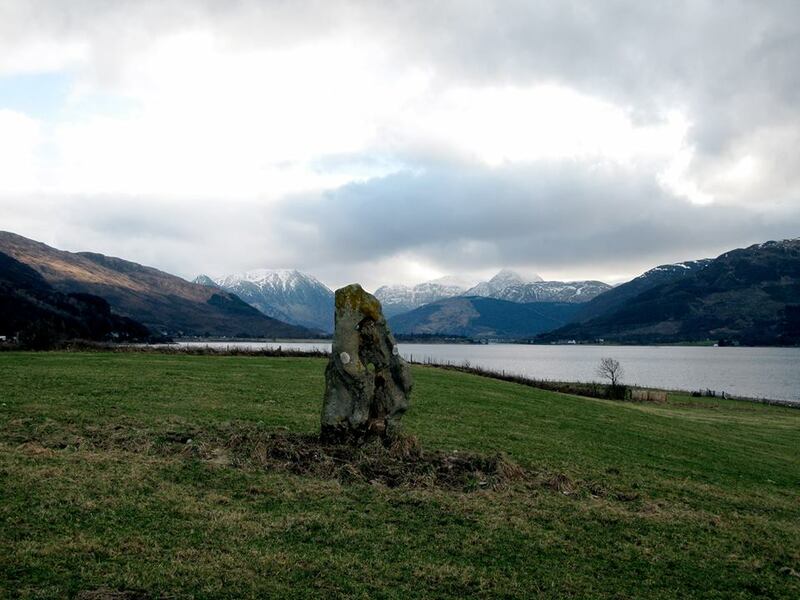 In this highland zone, it is easy to lose one’s sense of direction, so perhaps it was originally chosen simply as a distinctive marker of the location for visitors/customers where their tools could be worked on the polissoir, which effectively represented a Neolithic ‘industrial process’. 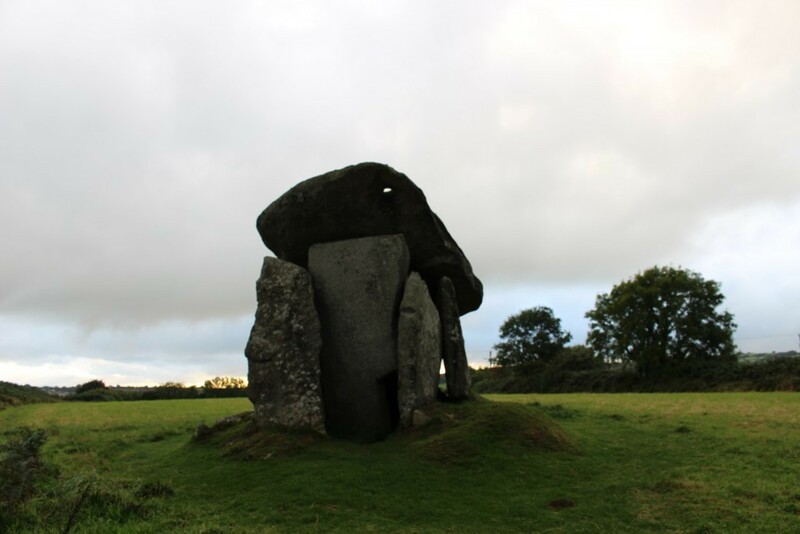 Trethevy Quoit in Cornwall, a Neolithic burial chamber constructed between 3700-3300BC, has a rectangular hole in the east corner of the capstone of unknown date, and drilled for an unknown reason. 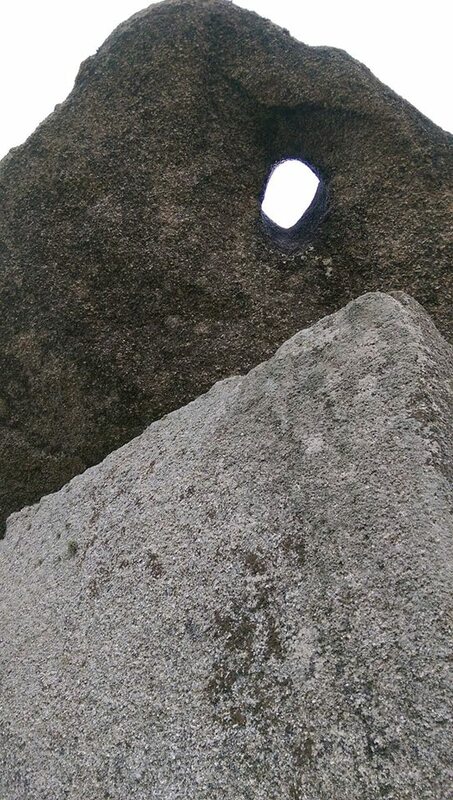 A rectangular hole in the capstone of Trethevy Quoit. 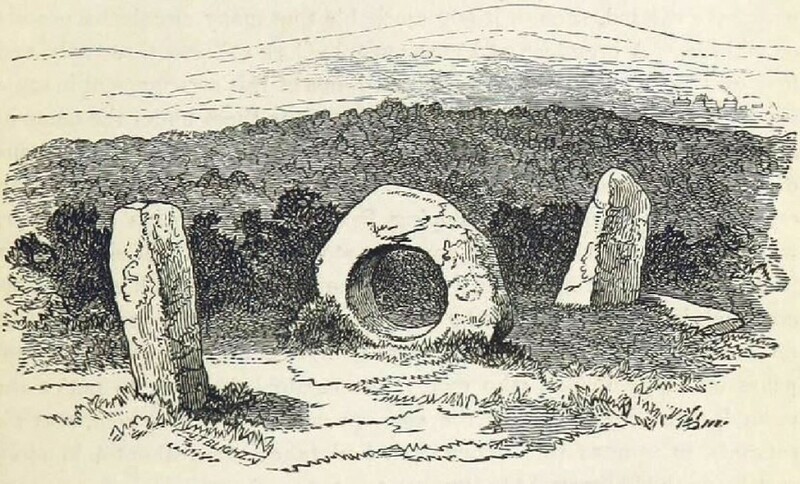 Another unique and holed stone in Cornwall is the granite Men-An-Tol, two and a half miles northwest of Madron, near Penzance, and described by Historic England on Pastscape here. 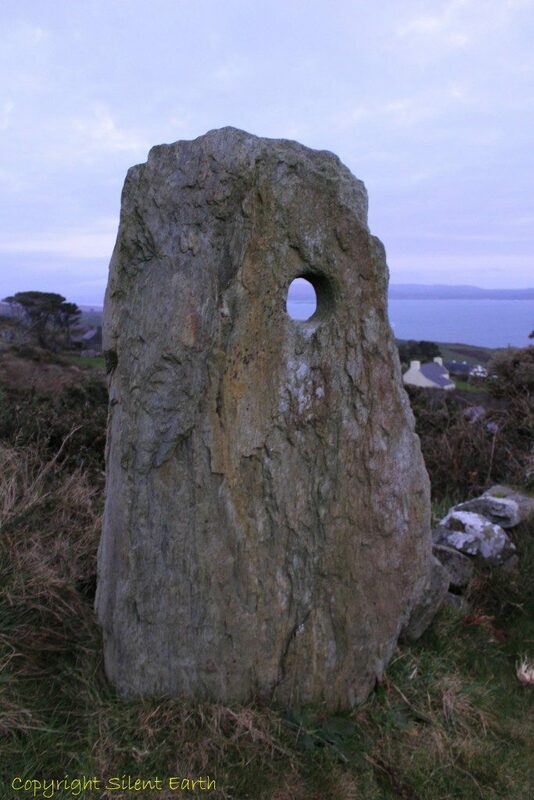 The holed stone was said to possess curative powers. To crawl through the hole nine times widdershins was said to be a cure for backache, rickets and scrofula, and children would be passed through three times. By placing a brass pin on the stone, questions were said be answered by the movement of the pin. The hole is 20 inches in diameter and large enough for a grown person to crawl through. 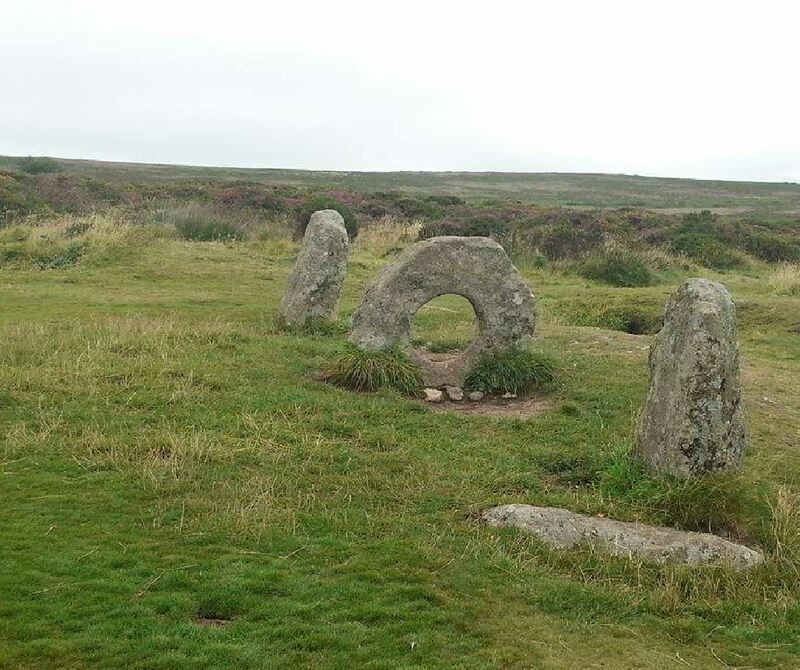 Known locally as the ‘Crick Stone’, Mên-an-Tol in Cornish literally means ‘the hole stone’. St Lythan’s chambered tomb here and here in the Vale of Glamorgan, Wales has a port hole at the top of the triangular, rear stone, kindly photographed below by Kim Iannucci. Wayland’s Smithy in Oxfordshire, a Neolithic long barrow, here and dated by English Heritage to 3590-3550BC, has a holed stone included in its fabric. Below Holed Stones in Bolleit, Cornwall. 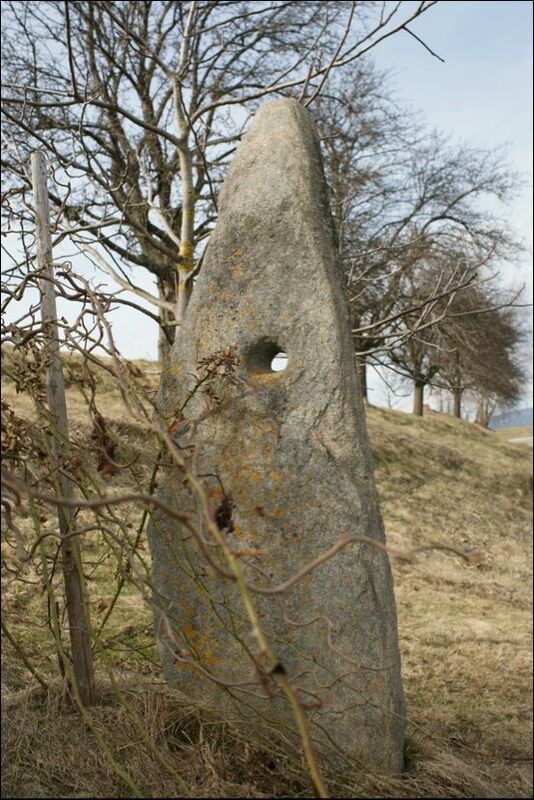 A holed stone in Austria, photograph kindly provided by Sabine Schwaighofer. I grew up on the south coast of England in Bournemouth, Dorset and, as a child, spent many hours aimlessly passing time beach-combing. As well as interesting sea shells and pebbles, my eyes were always on the lookout for stones with natural or sea-worn holes in them, as I had been told they were ‘lucky stones’. Perhaps in this childhood recollection is something of the fascination holed stones have always held for man. 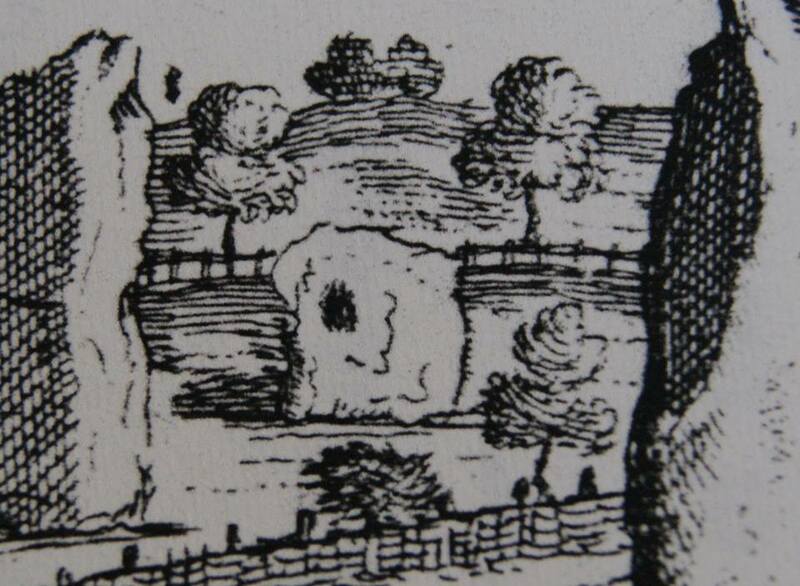 In earlier times, Dorset fisherman also adopted such stones as a protective charm against malevolent witchcraft. 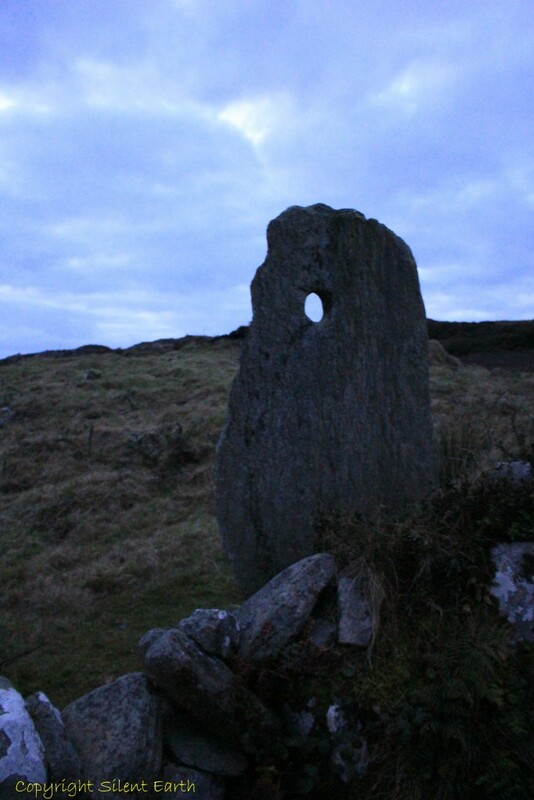 Below: The Caherurlagh marriage stone at twilight, looking west, 18 December 2016. Holed stones continue to be manufactured as garden and landscape features here in the twenty first century, so that perhaps distant future generations too can ponder over. 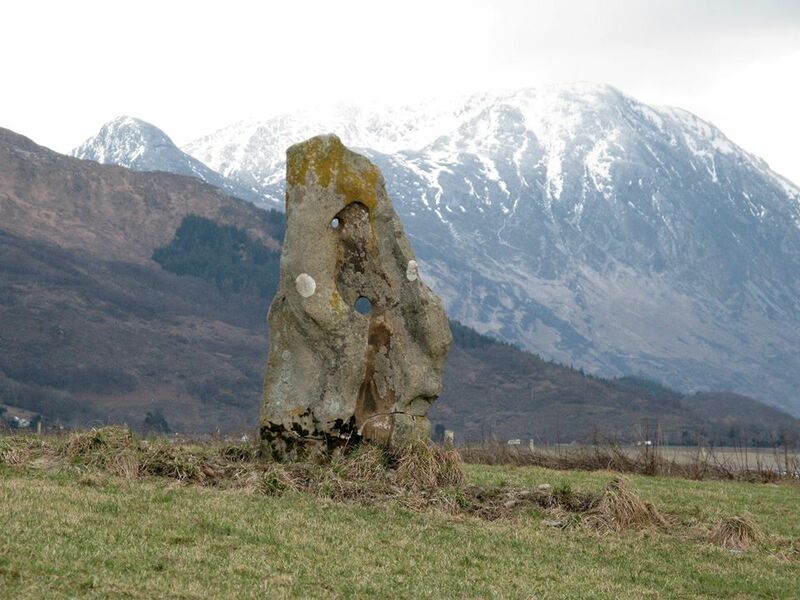 Thank you Murdo Macdonald for the two photographs below of Clach-n-Charra, Onich, Western Highlands, more on this stone here. Mr Macdonald adds Glen Coe is in the background of the upper photograph.